The fastest GTX 460 you can buy, but not the fastest full stop. 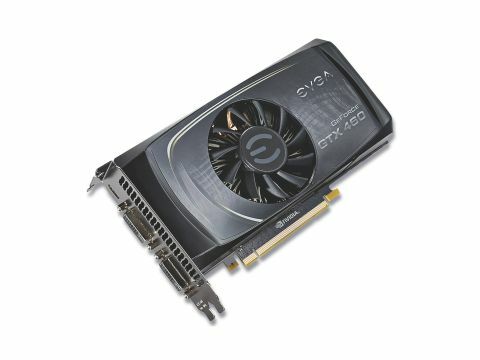 In the GTX 460 FTW Edition EVGA has managed to create the fastest out-of-the-box GeForce GTX 460 on sale. We've seen many other versions of this fabulous graphics chip, from all the big guns like Asus, MSI and Zotac, and it has been an absolute performance hero across the board. EVGA itself has got several iterations even of just the 768MB version. Based on the reworked Fermi architecture, the GF 104 GPU powering the GTX 460 is a streamlined version of the chip powering NVIDIA's top graphics card of today, the GTX 480. Now the GTX 460 has firmly established itself in the pantheon of graphics greats, the overclocked versions are taking centre stage. These tweaked versions of the card allow the different manufacturers to put there own spin on the design. Some go for advanced cooling, some change some of the extraneous components, while some even go for completely redesigning the PCB the chips sit on. Here though EVGA has done none of that. Instead it has tested and retested it's stock to find the fastest, most stable versions of the chip and overclocked them to within an inch of their lives.